Austin from Real Thai and Marc from Mental Masala are both heading out to Penang soon so I’ve decided to write this follow up post to Photo Blog: Penang Hawker Food to help them eat well in Penang. Start drooling now…here comes more food pictures! 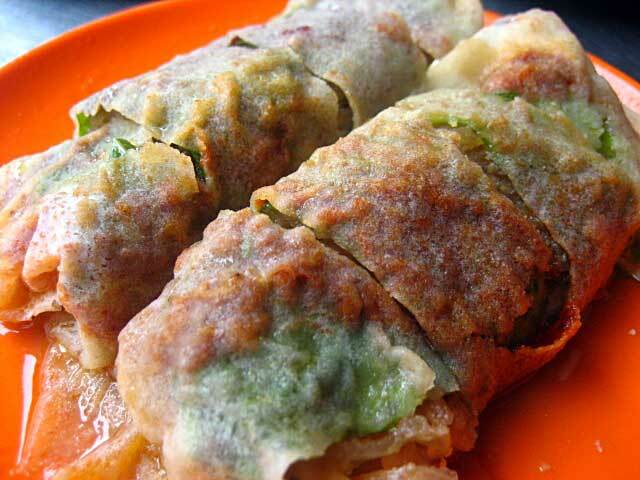 Popiah from Padang Brown Hawker Center. 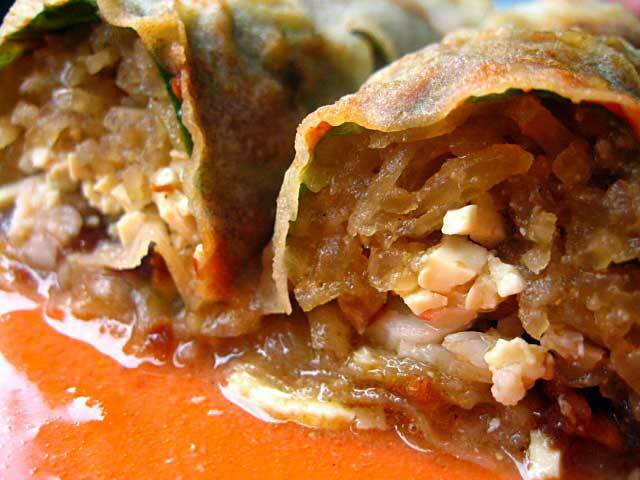 Filled with jacama (yambean), diced beancurb, crab meat and wrapped in fresh spring roll skin, Padang Brown Popiah is the BEST Popiah in Penang. 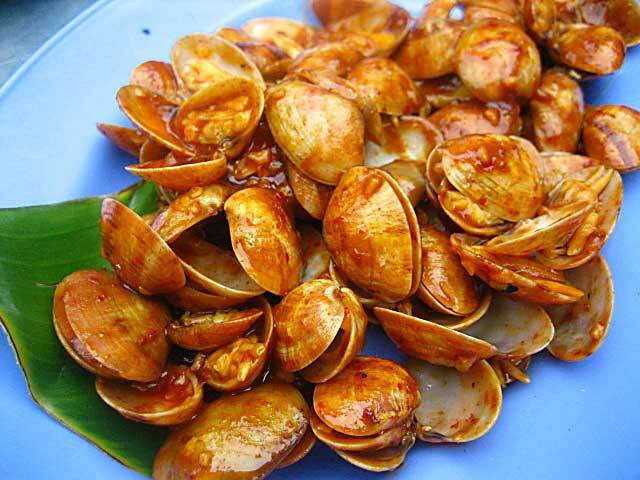 Curry-flavored clams from New Lane Hawker Joint. 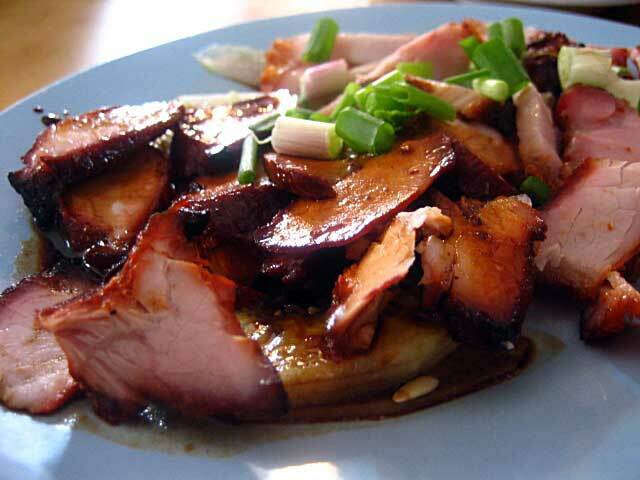 Char Siew or Chinese barbecued pork. 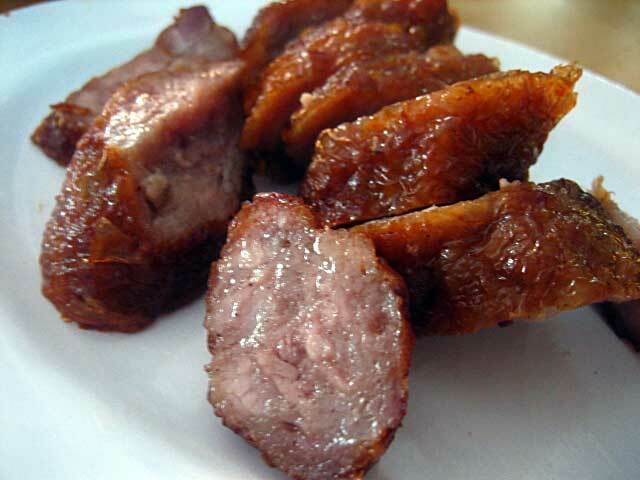 Char Siew is usually served with rice and can be found at Chicken Rice stalls. Loh Bak. These pork rolls are wrapped in beancurd skin and deep fried to perfection. Taiwan has a similar dish called Chicken Rolls. 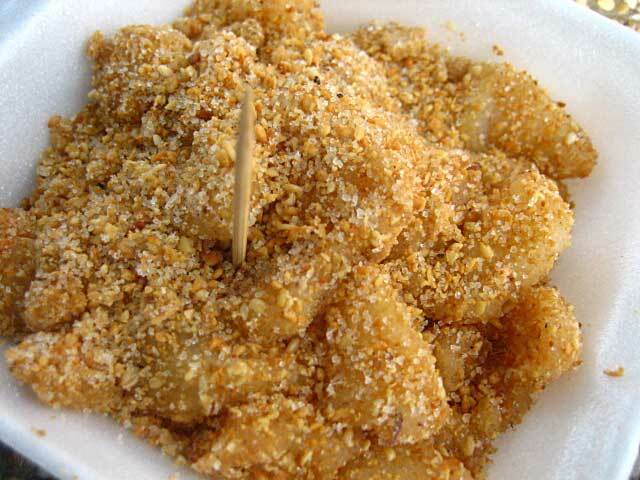 Muar Chee or Glutinous Rice Balls coated with ground peanuts and sugar. I simply love these! Real Roti Canai; not the frozen ones I get here in the States. Nasi Lemak with Sambal Ikan Bilis (anchovies) and a sliced of hard-boiled egg. 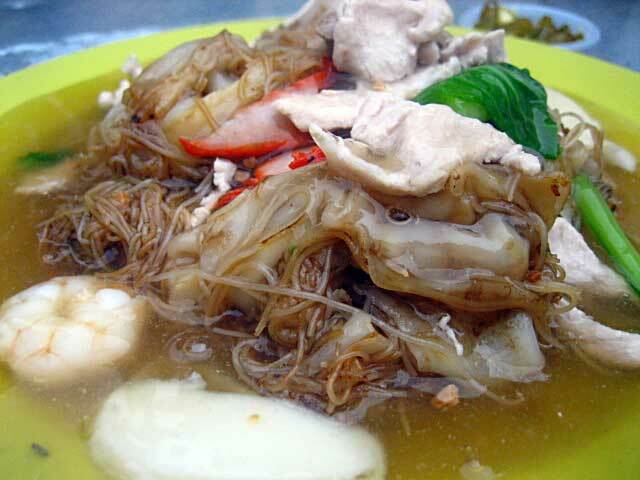 Penang Sar Ho Fun. 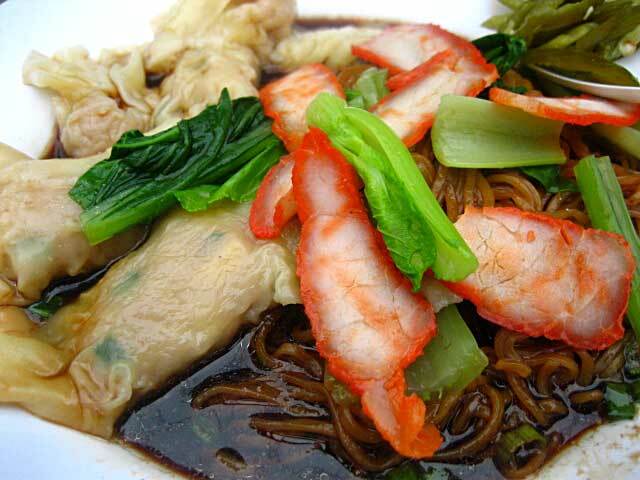 A Cantonese-style fried noodle dish. 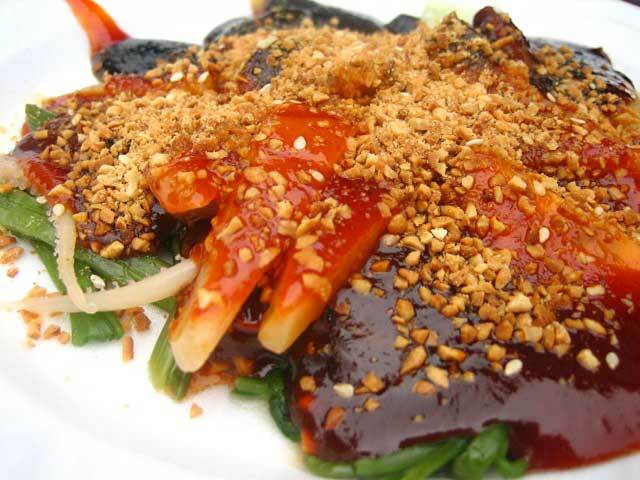 Ju Hu Eng Chai or Cuttlefish Salad. Delicious! 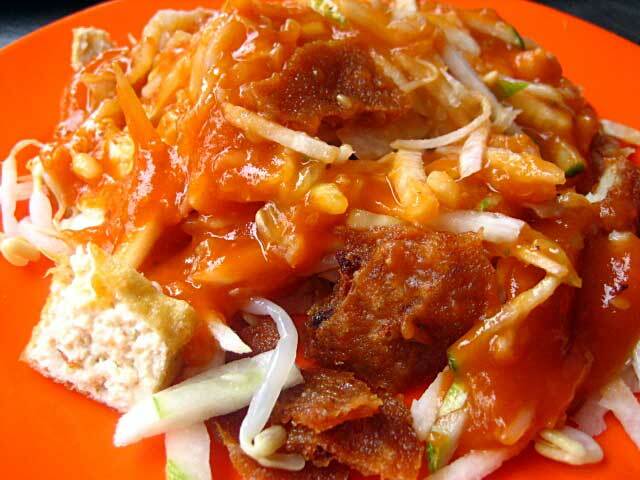 Cheh Hu or Chinese-style Rojak. It’s very tasty and best as an afternoon snack. 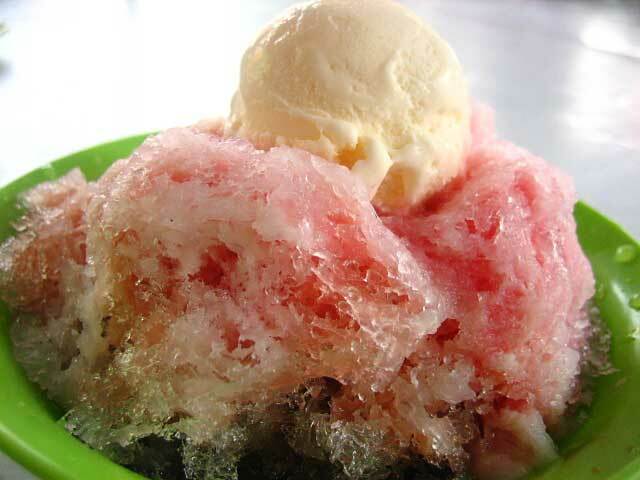 Cendol. A must try dessert. Yong Tow Food. 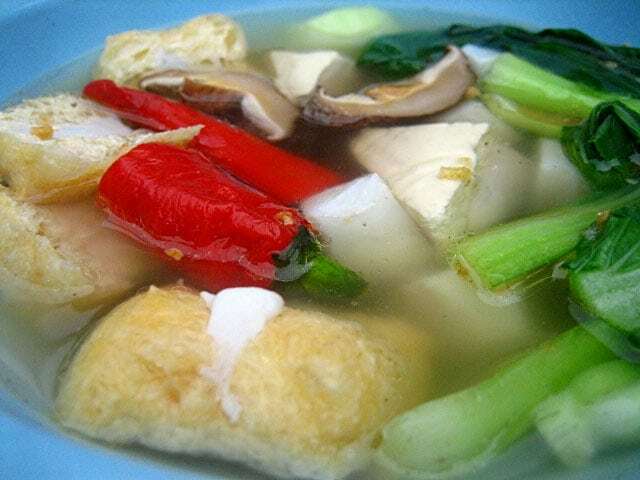 Various kinds of fish balls / stuffed fish paste served in a savory broth. Fish balls in Malaysia are fresh, succulent, and bouncy. And they are not all as there are a lot more to savor in Penang. In my honest opinion, not many places tops Penang when it comes to food. Penang is simply the best place for street food and Time Asia thinks so too. Thanks for the pictures. I will have to get on a plane and head out to Penang too. OMG, the popiah looks so delicious. Assam Laksa is on Photo Blog: Penang Hawker Food at http://www.rasamalaysia.com/2006/09/photo-blog-penang-hawker-food.html. the nasi lemak picture looks like the one in sri weld food court (beach street)? it is one of the best nasi lemak! 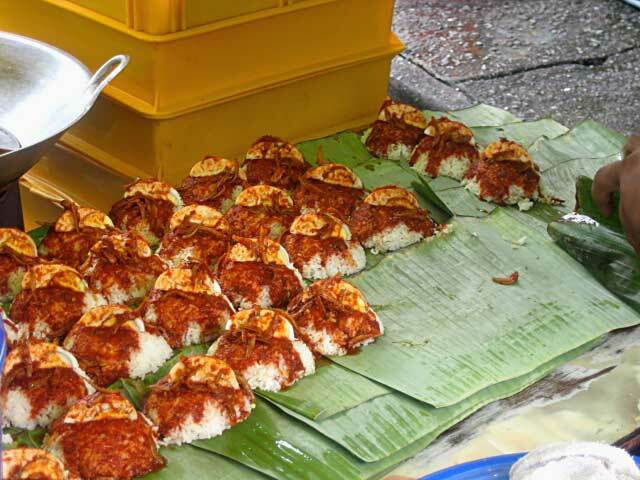 The nasi lemak picture was taken in Pulau Tikus morning market. I heard the Sri Weld food court nasi lemak is very good. Haven’t tried it though. There is a new nasi lemak place in Batu Lanchang Road (across from So Young Cafe) called Liverpool Nasi Lemak…it’s very good too. U got a ‘killer shot’ of the Sar Hor Fun, man! Lots of wok hei eh? I don’t fancy the ones in KL, the noodles all deep fried and hard. Glad to have you left a message on my blog. You have a great blog — keep it up and thanks for sharing. I just came back from a trip to Malaysia and Singapore and am blogging on the trip for the next couple of weeks. But… But… Taiwanese hawker food! In any case, this selection looks scrumtious. My diet will be in real trouble if I’m ever in Malaysia. Yours is definitely an anti-diet blog. Now any suggestion how to deal with the cereal & white bread? I want to eat all of the foods!!! I ate Curry Mee at first. I envy you because you can eat wonderful food if you want! Thank you for the infomations of delicious food! Eventhough you are showing us Malaysian hawker food, you are making me so homesick for Indonesia. Thanks for the site. Really…really nice. very beautiful photos, great job! U make me drool like a mad cow !! Your pics put mine to shame! Must lug my DSLR to the kopitiam! This is such a gorgeous blog! Positively dreamy pictures too! now someone give me $1200 for me to buy a ticket. I’m drooling…. yum yum yum…..
BTW, chicken wings? Errmm..there’s a stall at Pasar Malam Pantai Bersih, Bgn. Ajam B’worth that sells chicken wings. 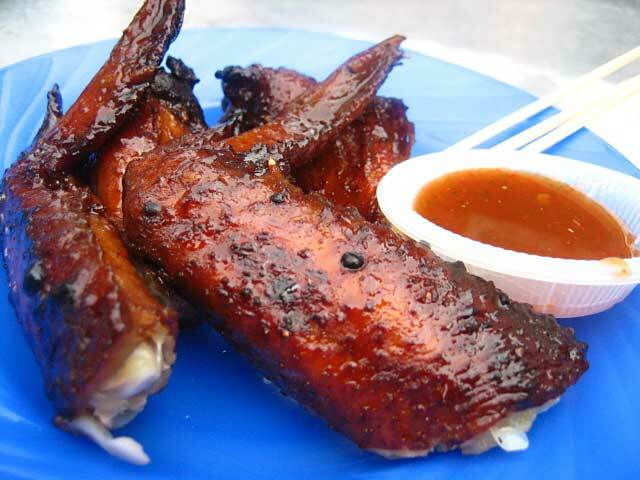 Look alike deli chicken wing =) try it! cost only RM1.30/pc.. no regret! AND I LOVED EVERY MINUTE OF IT. THE FOOD WAS THE BEST I HAVE TASTED. CAN YOU GIVE ME A RECIPES HOW TO TO MAKE YOUR CURRY PASTE AND CHAR SIEW? I’M SURE I WILL BE ASKING YOU FOR MORE RECIPES, BY THE WAY HAVE YOU WRITTEN A BOOK ON MALATSIA FOOD? David – No, I don’t have a cookbook yet, something that I wish to do in the future. Hi! I also was stationed in RAAF Butterworth 478 SQN Dakotas, from AUG 74 until FEB 77 and lived in Penang. For 2 and a half years I enjoyed the best tasting food in my life. No wonder they call it the Pearl of the Orient, it is a food lovers paradise. My Armah cooked the best Spring Rolls I have eaten in my life. A take away meal from Gurney Drive Hawkers every week was looked forward to. 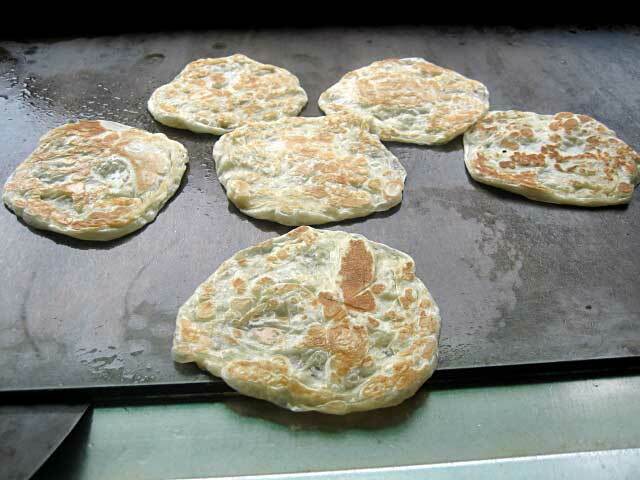 I used to love Murtabak, Penang Hawkers Fried Kwoy Teoh and the Satays. Everything is second class here in Australia to the quality and taste of the food there. To Grameme who sent me the email. I was also station at RAAF Butterworh. I was with 55 AIR DISPATCH SQN from 1963/65. we use to travel on the ferry from Butterworth to Penang every day. If I had my way, I would have loved to live in Malaya, to me food was outstanding and the people was so good to us. Before we got onto the ferry we us go to one of Hawker stalls and have curry sauce with chapatti which only cost a Dollar, this brings back so many great times. David and Graememe – you should go back to Penang again and rekindle your “love affair” with this magic island. A lot has changed in the past 20+ years but a lot remains the same, and that’s what draws people back to Penang again and again. Even just go back for the food, it’s worthwhile. My family runs a private tour + culinary tour, we can take you back in search of you favorite eats. You would be surprised as some of the places are still around, it’s just passed on to the new generation. yeah, penang’s yong tau fu is the best that i’ve ever had since i stayed there for 2 weeks. also duck rice near the adventist hospital, also the best duck rice. also recommend you guys to indonesia to try Tien Sim noodle at pluit sakti raya no 47north jakarta, that is awesome noodle. that 3 items are strongly recommended, and malaysian people says die die must try !!! 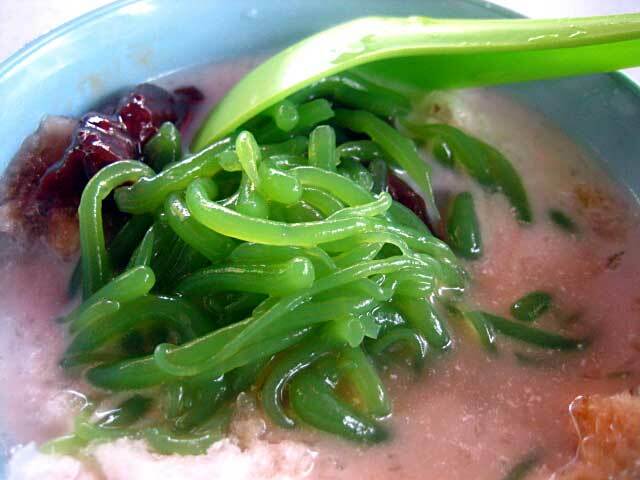 Hi, I love cendol, would you be able to post a recipe, one that is similar to the Penang cendol? Thank you. 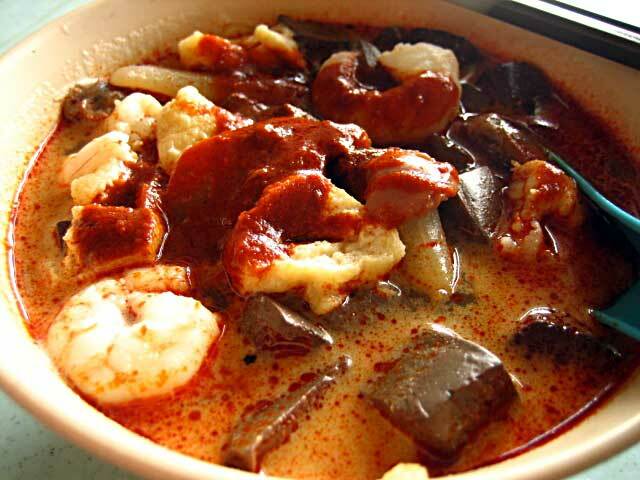 Really can’t help with those hawker’s food since i stay far away from my lovely home town – Penang. Perhaps i could cook some this weekend and share with my friends here with these marvelous food.. Thanks for the detailed recipes and great pictures! Great job!